One of my goals with auxillary training for a young speed seeking athlete is to build, strengthen, and shape his body to get the most out of his structure and try to turn him into a speed generating power machine. What does that mean? Well, that means I want to try to optimize or create on some level what Charlie Francis called, "The sprinters somatotype", characterized by well developed hamstrings, glutes, and strong hip flexors, and to strengthen these "sprinters muscles" to a large degree. Some people have that strength and relative muscular development naturally, the problem is most athletes aren't born with it and most training programs don't optimize it enough. This article is not meant to be an all encompassing guide on strength training for sprinters, but I do want to talk a bit about the key sprinters muscles that separate the good from the also ran. As I've written in previous articles, the primary difference between the vertical jump and a sprint is the activation level of the hamstrings. Both involve the quadriceps and glutes to a large degree, but one big difference is the hamstrings. The hammies aren't gonna make or break you in the vertical jump, it's possible to jump off 2 legs well with pathetically weak hamstrings, but if you wanna run fast, particularly have high end top speed, they're everything. If you're interested in speed you want to get your hamstring to quad strength ratio as high as possible. The ratio is typically around 60:40 quad/ham, with the quads being stronger. Good sprinters will be closer to 1:1. The hamstrings are inherently highly fast twitch, and contribute to force production best when force application has to take place at higher velocities. Thus, the faster you run the more hamstring contribution you get, and the stronger and more powerful your hamstrings the faster your potential to run. I suggest you strengthen the hamstrings from BOTH ends, the hip and knee end, which means you want to train them as hip extensors and as knee flexors. The hip extension will inherently be dealt with if you train your glutes properly, and knee extension function can effectively be addressed via glute ham raise variations. As discussed in previous articles, how fast you run is determined by how hard you push against the ground, which on initial though may give credence to the thought that it's useless to worry about the hip flexors, whose job is to raise your knee and pick your foot up off the ground. The infamous Weyand study indicated sprinters don’t move faster because they swing their legs any faster in the air, but they move faster by pushing harder off the ground. However, but how much force you can get into the ground is largely determined by how well you can set yourself up in between foot strikes to get in optimal position to push against the ground in the next footstrike. People that are naturally fast are set up to leverage force efficiently. This is in large part due to the way their muscles around the hip control their legs. They have excellent femoral control. This is caused by their naturally strong and well developed hip flexors, particularly the psoas muscles. A naturally slow athlete uses their knee extensors a lot when they run. It's not that the anterior thigh (quadriceps muscles) are unimportant but having them dominate muscle recruitment patterns in a sprint is inefficient. A naturally fast athlete uses their glutes and hamstrings and this largely is due to hip flexor/psoas strength allowing them to "set-up" optimally in between strides. Fairly recent studies have determined that a 12.2% increase in hip flexor strength improved 40 yd dash and shuttle run times by 3.8% and 9.0% respectively. 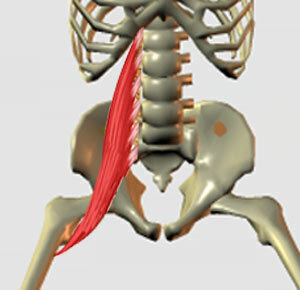 Another study found found that the bigger the psoas was in relation to the quadricep muscle group, the faster the 100m time was. Other studies have found fast athletes inherently have a much larger and stronger psoas muscle than average. To hit the psoas maximally and separate it from the other hip flexors, your thigh needs to be above parallel. One way to test your psoas strength is to stand with your back against a wall and bring one leg to your chest with your hands. Release your hands and try to keep that knee has high as possible. If you have proper psoas strength you should be able to hold your knee there for around 15 seconds. If you read my articles with any regularity you're not naive to the importance of having strong glutes. The glutes are the primary drivers of the hip and are important for most athletic tasks. They're even more important for the sprints. Ideally you want to strengthen the glutes using exercises requiruing horizontal force application, or hip hyperextension. These exercises involve action like a skateboarder, pawing back and throwing the legs back. The action is more specific to sprinting as it also involves hip hyperextension. You can also use hip thrust variations such as regular loaded hip thrusts or unloaded single leg hip thrusts. To summarize, faster running speeds come about via increased activity in the glutes, hamstrings, and iliopsoas (hip flexors) by accelerating the hip and knee joints more vigorously. If you're a young athlete or train young athletes don't neglect these muscle groups.